Of the three sliding sports – bobsled, skeleton, and luge – luge is the fastest, with elite racers reaching speeds over 90 mph. Strange, then, that it’s also the sport where you lie on your back, stare toward the sky, and maneuver the course from memory while you steer with your legs. Luge started in the late 1800’s in the resort town of St. Moritz, Switzerland as a fun sledding pastime for guests. It has evolved into an Olympic sport run on ice-covered concrete tracks almost one mile long, with a vertical drop of 300 feet. There are only thirteen artificially refrigerated, Olympic-style luge-bobsled-skeleton tracks in the world, and three of them are in North America: Lake Placid, New York; Park City, Utah; and Calgary, Alberta, Canada. A fourth, located in Whistler, British Columbia, is nearing completion. There are two smaller, non-refrigerated tracks in the U.S., one located in Muskegon, Michigan and the other in the Upper Peninsula town of Negaunee, Michigan. 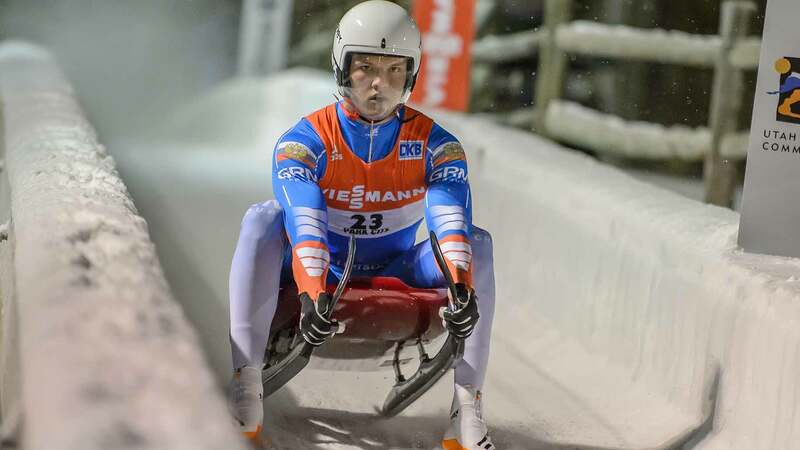 Unlike bobsled and skeleton, which can be learned fairly quickly, a luge athlete can expect to spend ten years advancing to Olympic skill levels. When you’re learning luge, you start from entry points low on the track and slowly work your way up the hill as your skills increase. It can take five years to reach the top of the track, where the 80 to 90 mph descents can eventually kick in. Meanwhile, athletes work on technique, learning how to memorize the track, and adjust speed and direction with subtle body movements. Racers steer the sled by pressing on the front runners with their inner calves or using their shoulders to put pressure on the back of the sled. At the end of the race, lugers sit up and pull up hard on the runners, forcing the back blades into the ice. If luge sounds intriguing to you, the good news is that the USA Luge Association(USLA), sponsored by Verizon, is actively recruiting new athletes. If you’d just like to give luge a try, or luge on a strictly recreational basis, there are outlets for that as well. And while USA Luge is particularly searching for young athletes between the ages of 10 and 14, keep in mind that Anne (Grandma Luge) Abernathy qualified for the 2006 Turin Olympic Games at the age of 52. Luge coaches in the USA are always on the lookout for exceptional talent. Since 1996, this strictly-for-fun tour has been visiting between 6 and 8 ski resorts each winter, introducing the sport of luge to the general public. You must be 10 or older to participate in this all-day event. Throughout the morning, Olympic and National team athletes teach children and adults the basics of luge, and you’ll get some practice runs on a recreational (plastic) version of the luge sled. In the afternoon, the best morning performers compete in timed races on a simulated snow luge course. Racers get numbered bibs to wear, hear their names announced on loudspeakers, and winners receive very nice prizes. Cost: Free. Olympic and National team coaches and athletes will teach you the basics of riding, steering, and stopping a specially designed, wheeled “street luge” sled. When you’re ready, you can try a few runs on a paved hill (sometimes a soap box derby route). You will also be tested for strength and fitness. If you impress the coaches, you may be invited to visit an ice track in Park City, Lake Placid, or Negaunee, Michigan to test your new skills on ice. Top performers will be invited to join the USA Luge Junior Development Team. From there, you can work your way up through a six-rung development ladder toward winning a place on the National or Olympic Team. Visit USA Luge to learn more about the Verizon-USA Luge Slider Search. You must pre-register for the 3-hour clinic, and the registration fee is $15. All of these camps require pre-registration and fill up quickly! Sponsored by the Wasatch Luge Club, these are 2-hour clinics for children, offered throughout the summer. Kids get coaching, take runs on a wheeled street luge, and if they show interest and talent, they may be invited to return for the winter training program. Cost: Free. This regular winter program is offered through the Wasatch Luge Club and makes luge available to local children age 9 to 12. It takes place at the Olympic ice track where kids will receive instruction and up to 4 abbreviated ice runs. Cost: Free. Anyone can attend these beginner clinics sponsored by the Wasatch Luge Club, but they are held on Thursday evenings throughout the winter (school nights) and mainly target adults interested in giving luge a try. Space in these clinics is limited and you must pre-register. Cost: $75. Three-hour introductory luge clinic for those 18 and over. You will receive instruction and up to 3 ice runs at the Utah Olympic Park. Cost: $150. This is a 4-day summer camp for children ages 9 to 14. Experienced coaches at Utah Olympic Park provide instruction for 10 Winter Olympic sports, including luge. The camp runs all day long, from Tuesday to Friday. Cost: $395. Offered at Lake Placid and Park City, these weekend fantasy camps function as fundraisers for USA Luge. Olympic and World Cup medal winners make up the coaching staff. You will receive instruction in starting, steering, and racing techniques, and will have two days of on-ice training and racing. You must be 18 or over to attend these fantasy camps. Cost: $2,000. There are four recreational luge clubs in the USA which offer opportunities for the general public to come out and give luge a try. Club experiences are open to adults as well as kids. The USLA will issue you a sliding permit. The Adirondack Club will put you on their “active sliders” list. You email the club to sign up for sliding sessions. Pre-registration is required. Lake Placid track fees – Day pass $25 (adults); $10 (under 18). Season pass – $125 (adults); $50 (under 18). The USLA provides club members with coaching during sliding sessions. Total cost for the first day at Adirondack Luge Club is around $110. See Wasatch Luge Club for membership applications and details. Total cost for the first day at Wasatch Luge Club is around $75. See Muskegon Luge Club to download their waiver form and learn more details. The track at Muskegon is a shortened artificial track made of wood, rather than concrete. It is non-refrigerated, but has banked curves and is used for training and local competitions. It is open to the public, with introductory lessons as well as races, but you must call ahead for reservations and pre-registration. Races open to the public. Races are held every Sunday afternoon and are open to the public. You must have taken a lesson prior to racing. Total cost for the first day at Muskegon Luge Club is around $40. See Upper Peninsula Luge Club for details and a video. The Lucy Hill Naturbahn Luge Track is the only certified natural ice track in the United States. It is 812.8 meters long with 29 curves. A natural track differs from an artificial track because it is non-refrigerated, the racing surface is flat rather than banked, and it follows a very twisting route through a forested area. Natural ice luge sleds differ from artificial ice sleds in that they are more flexible and somewhat easier to steer, have sharp rather than dull runners, and construction is different as well. Racing and steering techniques are different as well; natural track lugers occasionally sit up, lean side-to-side, and drag their hands or feet on the ice to control their descent. Speeds in natural track luge can hit 60 mph. When you’re just starting out, the only gear you might want to buy for yourself are elbow and knee pads. You should dress warmly since you’ll be outdoors the whole time, and wear an old jacket, since luge is hard on clothes. Helmets and sleds will be supplied by your club or team. When you feel you’re ready to purchase your own gear, check with your coach (or the US Luge Recruitment and Development Department) to get professional advice about sizing, and to take advantage of team discounts and reduced prices.